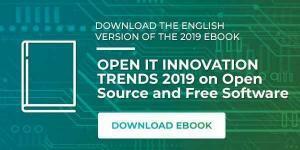 Before we go into Easter Break we would like to share with you this video we made on the the Top 10 Technological Trends for this year, in Open Source and Free Software. Artificial Intelligence (AI), Intelligent Machines and Systems. Internet of the Things (IoT). Big Data & Open Data. Drive digital transformation with Open Source. Open Source is a cultural change. Are you interested in knowing more about these trends? 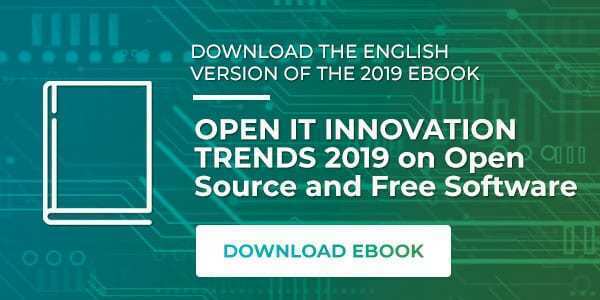 Download our eBook, where you will find the technological innovations in Open Source and Free Software from the standpoint of more than 100 professionals in the sector. What are the new digital and technological professions of 2019?